You are in one magic room. That room is having two doors. one door leads to death and another door is safe. If you ask a question, one door always tells truth and another door always lies and you don’t know which one tells truth and which one lies. You can ask only one question to only one door and you must get through the safe door. So, how will you manage to get through the safe door ?? 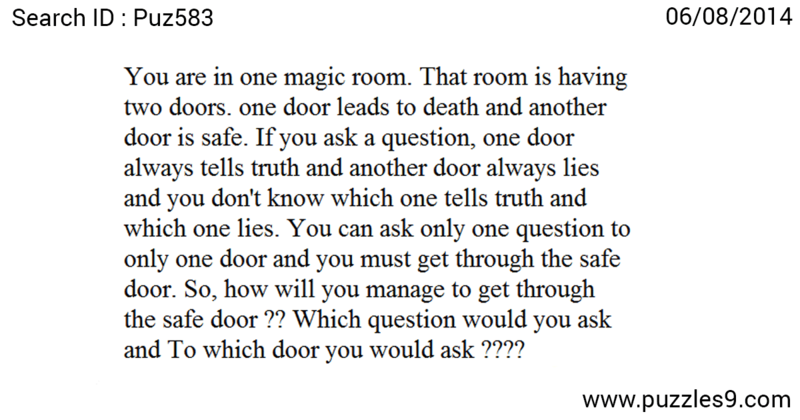 Which question would you ask and To which door you would ask ???? Answer : Just go to any one door and ask, “what the other door would tell if you asked which door is safe?” and go through another door. That’s it. So, the question is important and the door to which you are asking doesn’t matters.